Zaya Gilmer had been attending New Life Covenant Church in Palatine, Illinois, for just one month when she noticed John Moon’s name on the prayer list in the bulletin. Diagnosed with renal failure at age twenty-six, John had been on the national registry for a kidney donation for three years. The New Life community was praying that he would find a donor. It wasn’t the first time she had so clearly sensed God’s direction. Zaya, who works at Covenant Offices as coordinator of administrative support for Serve Globally, left her home in Mongolia in 2002 to go to school in New York City. She earned an associate degree then found a job as a medical assistant. But she felt dissatisfied. She began to explore different religions but still felt no purpose or identity. Her new faith led her to Mount Zion International School of Ministry in Grantville, Pennsylvania. While she was there, she met Dennis Gilmer. 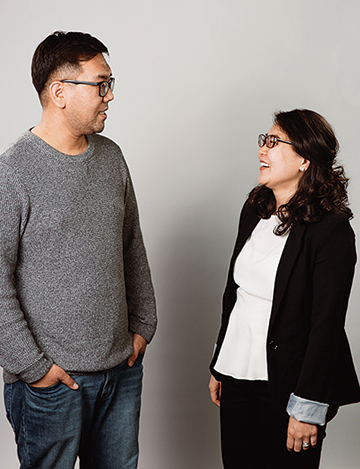 They began dating, but Zaya felt called to ministry back in Mongolia after graduation. She left the States, trusting that God would bring her and Dennis back together somehow. After a year she returned to marry Dennis, and eventually they moved to Chicago. By this time they had a newborn daughter. It was a while before Zaya and her young family began attending New Life Covenant—three years in fact. They had visited several other churches but had not felt settled in any of them. Then, in January 2016, Zaya visited New Life Covenant and immediately sensed God’s presence. “I felt certain that I had found our new church home,” she says. Initially John was guarded. He had been working in Korea at the time of his diagnosis but had to move back to Chicago to receive dialysis three times a week. He knew how unlikely it was that Zaya would be a match. Almost 122,000 people are waiting for organ transplants in the U.S. Of those, over 100,000 are waiting for a kidney. 13 people die each day waiting for a kidney transplant. The following Sunday when Zaya asked Joon to introduce her to John, he was shocked. He hadn’t realized that she didn’t know John at all. “I had seen his profile picture on Facebook, so I knew what he looked like before we actually met,” says Zaya. When they sat down together, she asked him what steps she needed to take to give him her kidney. She remembers that he looked quite ill and didn’t show much emotion other than shock that this complete stranger would make such an offer. He provided her with the contact information for his doctor. visit to a specialist to measure the size of her kidney. As each test was completed, Zaya continued to be a perfect match. The morning of August 15, both Zaya and Dennis felt at peace as they kissed their daughter, Liana, good-bye and headed for the hospital. Joon met them there. With her husband on one side and her pastor on the other, Zaya headed in to be prepped for surgery. While Zaya was in the operating room, John had one final dialysis treatment. Each surgery lasted around four hours, and they were both brought to the same floor for recovery. But John was moved to intensive care for observation when his body began showing signs of rejecting the kidney. After a short time, however, they received word that the kidney was functioning and that John was going to be okay. For the rest of her life Zaya has to drink about three liters of water a day. She has discovered how healthy that simple practice makes her feel. She says she has never felt better. The church is made up of people and people fail. But God is good all the time. Hopefully the story turned your frown upside down again. You’re nature is too positive for you to dwell on the negative. We had a similar situation at our church except the two people did know each other. Ended up a person who did not like needles and couldn’t give blood without fainting was able to donate a kidney to someone else. Both people recovered. The person who received the kidney went on a number of mission trips after that. It truly is amazing what God does when we say yes! Thank you for your example of sacrificial giving!! I am blessed to have gotten to know Dennis a bit at NPTS, I’m looking forward to meeting you soon. Bless you Zaya!! Thank you for sharing this powerful, life-giving story! It is life-giving to look at what God is doing. I’m afraid I’ve been more focused recently on Church’s failures than on God’s amazing goodness! Good news is a rich blessing. So courageous & generous. God bless you Zaya & your family.